Alright. My Dad promised we’d blog and so here “we” go. He’s asleep, as it’s 1:00 AM here. So, this should be good! We’re in Prague! In fact we’re already leaving Prague tomorrow. In the past 48 hours we’ve been in Geneva, Frankfurt, Pilsen and Prague (and all of the highway in between that I couldn’t really see because Kevin was driving about 200 MPH (reality: 120 MPH)). However, I digress — “How did it all start?” might be a question you would ask. Well, it all started with packing. The only relevant fact here is that my Dad’s suitcase is twice the size of my Mom’s and mine. He claims this is because he’s carrying 4,000 pairs of our shoes. This assertion is only partly true. Only 4 pairs of shoes in his suitcase are not his. The other potentially relevant fact related to packing is that it totally freaked out not one, but TWO Bernese mountain dogs, who anxiety-panted more than a type-A high schooler before the SAT. In any case — off we went. Our journey was relatively uneventful. I forgot my phone for about 20 minutes at a Swiss security point, Mom thought her suitcase was broken into (it wasn’t), but other than that, our journey to Frankfurt was easy and fun. Upon arrival in Frankfurt, we got in our lovely rental car and began driving (really fast) to Prague. Once we’d sorted out the GPS system in the car and switched it from kilometers to miles, we entered in the address for Pilsen Urquell brewery in the town of Pilsen or Plzen, for those if us who hate vowels (Czechs). Kevin and I did a tour at the brewery, which ended with some awesome underground tunnels and a glass of unfiltered/delicious Pilsen. It also featured a lovely tour guide who spoke about 70% English and who was also forced to pretend that she was from the 19th centuryf. Quote: “You’re going to be getting on this technology I’ve never heard of called a ‘bus’ — I don’t know what that is because I died in the 1930’s, but I hear they are good.” Amazing. After the tour, we spent a great afternoon at the beer garden then headed on to Prague. Prague is incredible. It’s like Disney World: 15th Century. Thankfully, there’s a fair amount of graffiti, so I am convinced this is a real city. Once we arrived, we checked into the hotel and Mom maneuvered an upgrade into two junior suites. Humblebrag: mine is two levels. We also went out and ate some typical Czech food, which Kevin claims is not all that different from traditional German food. Despite being a vegetarian, I had a great meal of potato soup in a bread bowl. I like how the Czechs are very pro-carbohydrate. Today, we did all of the Prague things there are to do (or rather, mostly hung out in Old Town, gawked at churches, went to Prague Castle and drank a lot of beer/Czeck wine). The pictures I’ve uploaded to Flickr tell this story far better than I could, so I’ll leave it to you to click on through. Read: I drank 5 beers today and I’m tired. For now, I’m off to sleep. 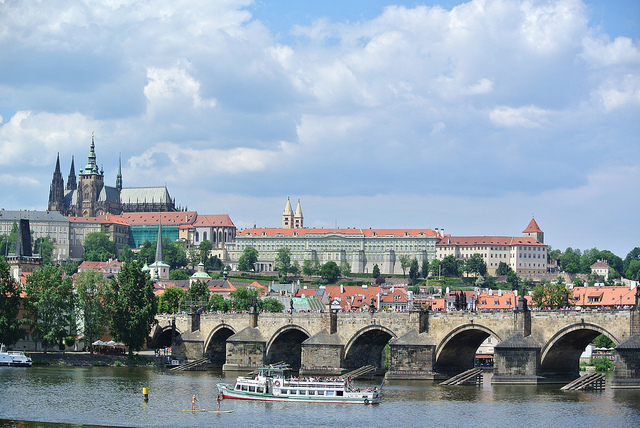 We’re heading on to Austria tomorrow, if the trip is relatively uneventful I will share more specific info about Prague — this post is already waayyyyy too long! Yeay for brewery tours! Sounds fun!!! Sounds like you all are having a BLAST! Makes me miss Prague, too. Big hugs. Photo/video not coming through for some reason. Probably my machine. Have a blast you guys! I’m jealous. thanks for fixing the photo Katie!!!!! !